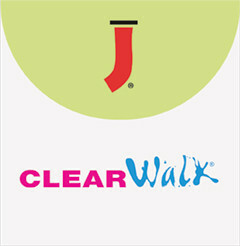 ClearWalk™ is a transparent anti-slip media for short and medium term applications. The translucent film has a textured, non-slip surface. The reverse side is coated with a pressure sensitive adhesive which can be applied indoors and remains easily removable without residue, even after long use. The secure, slip-resistant and chemical resistant surface is extremely foot friendly. Can be used in pools, showers, or saunas.